For some years, I avidly followed a certain political/cultural writer until finally – you know how it can be, between authors and readers – we drifted apart. I thought her commentary was simply declining. One symptom of this decline was an overabundance of the word serious. It wasn’t right or left or even right or wrong anymore: The new word – the only word – was serious. Our national diagnosis was a lack of seriousness and our national prescription was to get serious. Our leaders weren’t serious and they didn’t know how serious things were, but if everybody would just get serious we would all be serious and then things could finally stop being so serious. I lost interest, but I had a thought: To be serious is not enough. And can’t a serious person be just as wrong as an unserious person and, in certain situations, even more disastrous? This principle can be applied to art as well as people. You may hear much of serious art or a serious work, but the phrase tells little of the real quality or worth of the work. 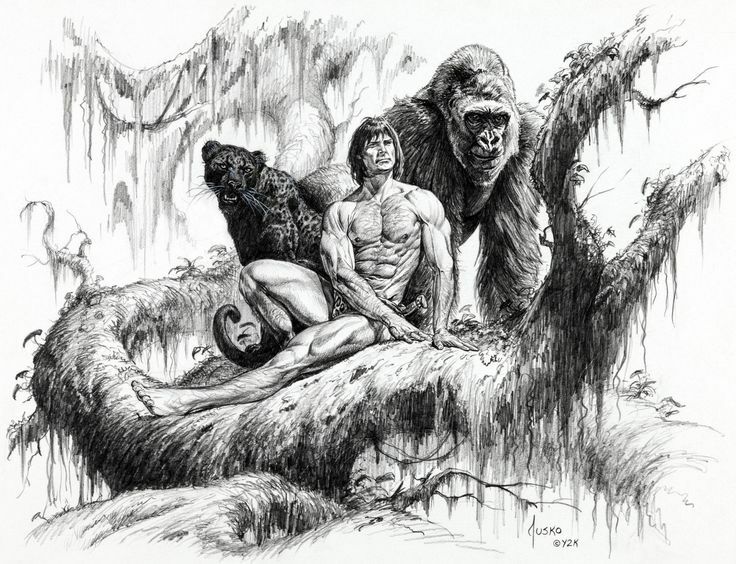 My favorite example of this disconnect between seriousness and worthiness is Edgar Rice Burroughs’ Tarzan of the Apes. The most shocking thing about Tarzan of the Apes is that it is a genuinely serious book, a story written around ideas. The second most shocking thing is the book’s level of racism. Given the period in which Tarzan of the Apes was written, a certain degree of racism would not have been surprising; when racism is dominant in society, it is inevitably reflected in (some of) that society’s art. But even with that forewarning, the racism of Tarzan is surprising in its pervasiveness, in how deeply and how elaborately it is woven into the story. These two elements – the book’s seriousness and its racism – are not at all in contradiction. Indeed, if Tarzan of the Apes had been less serious, it would probably have been less racist. Burroughs might have still, in the appearance of a minor black character, invoked cheap, false stereotypes, but he would not have taken such pains to present thoroughbred English aristocrats as the highest human type. That was Burroughs’ elucidation of the theory of eugenics. 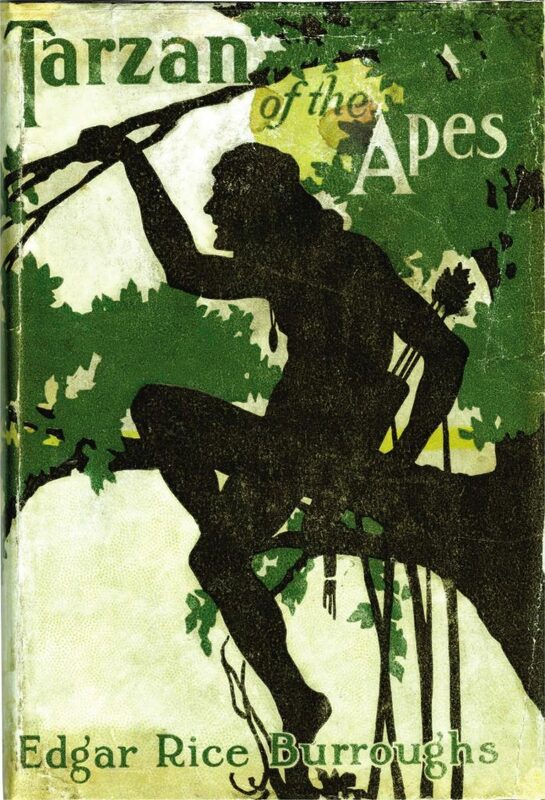 Tarzan of the Apes revolves around nature v. nurture, the effect of environment and the effect of genetics; it is also wrong about nearly everything, from the truth of eugenics to the likely consequences of a childhood totally without human interaction. But books, like people, are not any less serious for being wrong, nor less wrong for being serious. All of this emphasizes the essential ambivalence of what we call seriousness. Serious is more a description than a judgment, more an attribute than a virtue or a vice. To be serious is not to be good, or even to be deep, but the ambivalence is greater than that. Serious ideas, cogently presented, are as likely to be false as to be true, and some of the most serious works are also among the most malignant. So if anyone, or anything, is commended to you as being serious, remember that this could mean seriously wrong. The foundling raised by animals in the wilderness is an immemorial idea. A couple weeks ago I reviewed a movie about one of the most famous of these foundlings: Mowgli, raised by wolves in the jungle. Today I will review another movie, this one about another foundling of almost equal fame: Tarzan. Disney released its animated version of Tarzan in 1999, on the dying wave of the Disney Renaissance. After the wave crashed, Disney languished in cheap, lusterless sequels for a decade; as it crested, it released celebrated films such as Aladdin and The Lion King. In between, Disney released more experimental, and now largely forgotten, films – Atlantis, Treasure Planet, and, of course, Tarzan. Tarzan is the least experimental of the three. It’s a departure from classic fairy tales, but still fantasy, unlike the sci-fi incursions Atlantis and Treasure Planet. The Disney formula of orphaned hero, boy-meets-girl, and animal sidekicks is intact. Variations are evident, however. 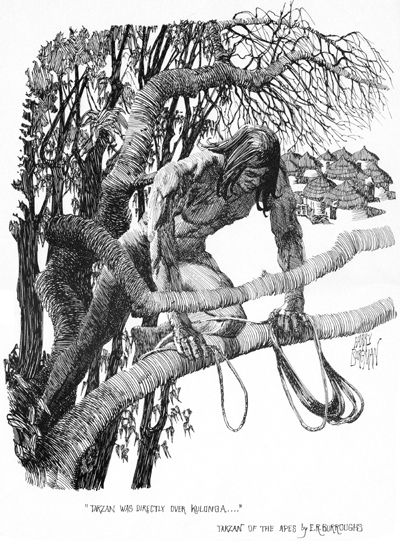 Tarzan is an unlikely hero, his character made up of two divergent halves – one the epitome of physical strength and skill, the other naive and imitative in the most childlike way. The lively Jane, with her scientific interest and artistic bent, is an unusual heroine, neither too timid to slap Tarzan nor too proud to demand his help. The music follows a similar pattern. Tarzan features the classic Disney spate of songs, hurrying the story along and encapsulating character motivations. Phil Collins, writing the songs, provides a departure of style. The lyrics are written from the viewpoint of various characters but sung by one outside singer – a technique curiously reminiscent of the songs in Toy Story. The music may well be the highest-quality element in the movie, although the stellar animation of Tarzan’s physical agility and ape-like mannerisms comes close. Tarzan is strongest in its lighthearted moments; when the movie wants to be entertaining, it is. It stumbles when it tries to be dramatic. Tarzan’s adoption by the gorillas, and Clayton’s trickery, are competent and more. But outside of these and a few other moments, the drama fails to be convincing. A great deal of this failure springs from Clayton, who manages to be, as the story’s villain, both over-the-top and underachieving. He is so obviously bad you wonder how Jane and her father ever got mixed up with him in the first place. On the other hand, his ambitions aren’t scary, or even particularly impressive. He wants to capture some gorillas alive! Only two of whom we have, as the audience, any reason to care about anyway! Remember when Disney villains plotted spectacular revenge and to take over kingdoms and control powerful magic and fun things like that? The film is also unconvincing in answering the question it sets itself regarding Tarzan’s nature and place in the world. It comes too quickly, with too little reflection and reckoning. This disappoints me because the question was so interesting. It is, however, the movie’s lesser failure. Despite the film’s stumbles, Tarzan is a fun romp with two or three musical numbers that are good almost to the point of being addictive. Unlike Tangled and Beauty and the Beast, it may not stand up to a thousand viewings, but it is certainly worth at least one. Postscript: About that music … It’s been in my head. Now it can be in yours.